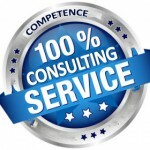 The consulting firm with practical experience ! We will not assail you with nowadays trendy phrases just in an attempt to make an impression. We listen, ascertain your needs and provide a proposal without a prepayment, our solutions are sustainable and without grandstanding.